Michigan job shop strengthens position in wind energy manufacturing with MAG horizontal boring mill – its sixth MAG machine tool acquisition since 2006. March 2010 — Merrill Technologies Group President Bob Yackel (center) presents a plaque to Michigan Governor Jennifer Granholm in recognition of the Governor’s support for the Clean Energy grant awarded by the state’s Department of Energy, Labor and Economic Growth. The presentation was made March 9, 2010 at the company’s facility in Merrill, MI. 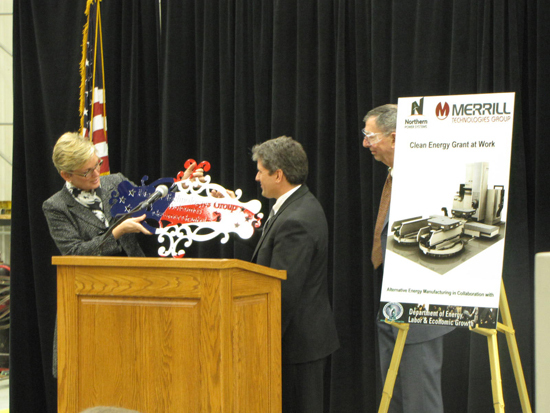 Merrill will use the grant to purchase a MAG MC 1600 to manufacture large wind turbine parts. The MC 1600, a machining center-type horizontal boring mill, automates large-part production and reduces non-cutting time with a pallet shuttle system and tool changer. The machine’s 1600 mm x 1600 mm (63 in x 63 in) table handles parts up to 15,000 kg (33,100 lbs). This is the sixth MAG machine tool purchased by Merrill since 2006, as the company continues to diversify its customer base and serve the wind energy industry. Merrill also has two MAG RT 1600 boring mills, two vertical turning centers and a horizontal machining center. The new machine will be delivered to Merrill on April 1st, and Yackel says the first parts on the machine will almost certainly be wind-related, as a result of recent new business acquisition. Michigan’s Centers of Energy Excellence program provides seed funding for clean-energy projects that create jobs in wind and other alternative energy sectors by leveraging the state’s research and development expertise in advanced manufacturing, engineering and materials sciences. The federal Department of Energy (DOE) has said that Michigan is in the top five states for wind power generation potential and in the top four states for wind manufacturing jobs potential. DOE estimates Michigan has the potential to create more than 30,000 jobs by 2030.